Do you think your life will get better in the future? Geoff Smart had some doubts. He saw what you see how broken government has become. He worried about his career, his family's future, and our everyday quality of life. Then one day, Geoff received an unexpected message that changed how he saw the problem. Geoff was asked to help. His journey took him behind the scenes to work with other private sector leaders who had made the leap into government. What he discovered will surprise you. 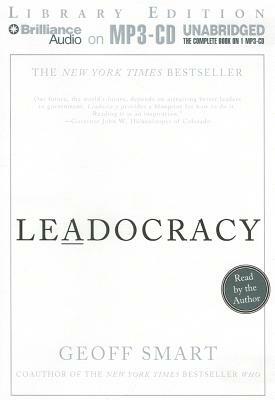 Leadocracy will tell you Why great leaders avoid government How the 3 As of Leading can help us identify, hire, and become better leaders How we can avoid nonleader candidates like the Turtle, Bureaucrat, Screamer, and Idealist How the adrenaline rush of flow can offer leaders from the private sector the adventure of a lifetime Thomas Paine's Common Sense painted a vision that inspired a generation and changed the course of human history. The movement of our time is leadocracy government by society's greatest leaders. Leaders like you.